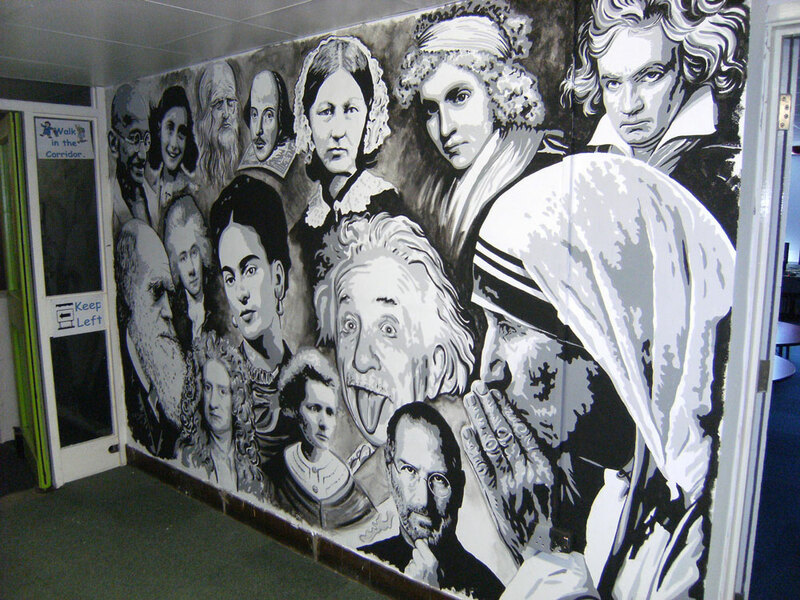 You are currently browsing the category archive for the ‘Fulbridge Champions Mural’ category. Finished! It was a close thing however, even more spectators spoke to me as the painting neared its conclusion. I began the day by completing Beethoven’s wild swirling locks which I didn’t finish yesterday. As much as I admire him, today I would have preferred it if he was bald! This was the last area of detail before revisiting and modifying previously painted features, and linking the composition together by painting a series of vigorously applied washes which I had originally considered as my opening act. I think I made the right decision to work the way I did, the method I used ensured that the image has been revealed in the same way a gradually opened curtain allows light to enter a dark room. Perhaps having observed my methodical approach and seeing the painting develop each day, the children might even imitate my working method and try working this way themselves. My last act was to put some final touches to the face of Leonardo which was the most difficult part of the painting as the source used was his portrait in red chalk c.1512. I took some photographs and cleared the corridor at 4.45. It’s been a good project and in this I’m not just making a reference to the painting, but with my fitness too. All has worked out well but as happens with every painting, there has been a tug of war to some extent. Paintings are like living creatures and develop their own characteristics as they grow, I’ve not had it all my own way. I firmly believe that at times they take over and paint themselves, and you have to adapt accordingly. The same has been the case here but I’ve had the final say. William would say ‘All’s Well That Ends Well’, but I’ll finish as I began and leave the final words to Freddie……………. Some good news. Some bad news. 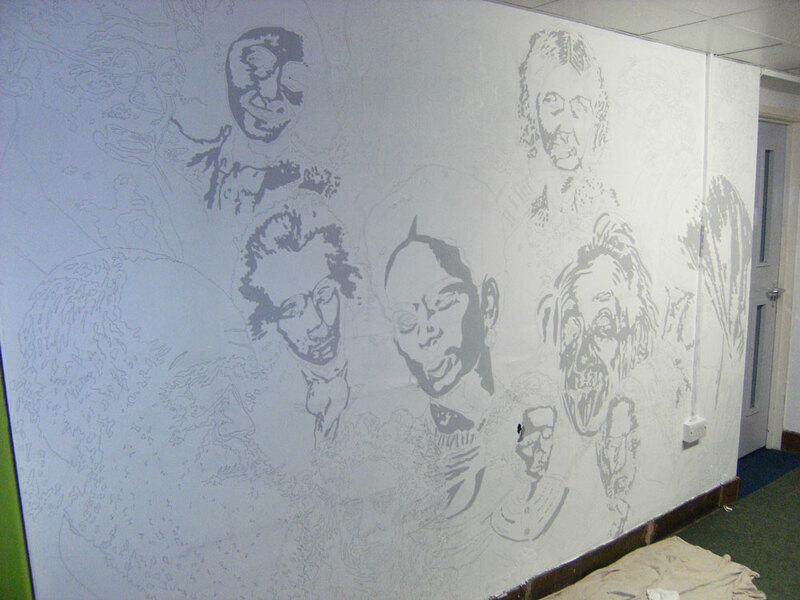 Day 5 of the mural and the good news is that it’s taking shape very well; the bad news is that I’ve been unable to complete it within the time frame I’d estimated. Had I spent the week painting in the privacy of my studio I would have finished, but that wasn’t the objective, the many conversations I’ve had were a necessary part of the exercise. Iain doesn’t seem unduly concerned, he’s happy for me to return on Tues. He’s been a perfect host, presenting me with a mid morning hot chocolate every day – and when he’s not been around has arranged for someone else to bring one to me. I wonder if this habit might continue next week when I’m back at my studio! I showed several children the painting today by viewing it through the ‘wrong’ end of a pair of binoculars, which offered a distant overview of the composition not possible in the corridor without observing it from an angle. Many have asked the identity of Mary Wollstonecraft, and today I told them her daughter was Mary Shelley who was married to a very famous poet. I received many visits during the rest of the day from children telling me they had found the title of her best known book. I also spoke with a girl with severely impaired vision. She’s walked past several times this week and today I asked if she could see what I had painted. 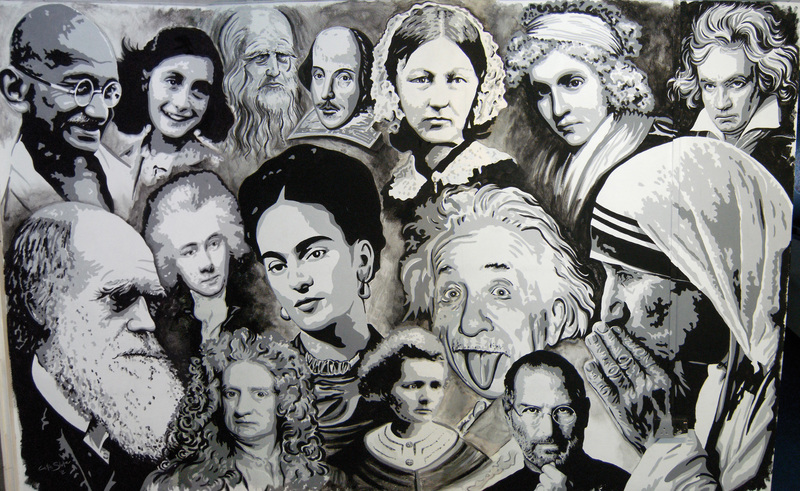 Now that the black paint has been applied contrast within the portraits has naturally increased and I was pleased she was able to see the eye of Marie Curie. Not that she recognised that it actually was Marie Curie of course, but then again she’s not alone, there are a few who have suggested she looks like Ryan Giggs. As more time passes I’m beginning to agree with them! I do hope that when it’s finished she might be able to identify the shapes and see some faces, whether she can recognise them or not. I left the school at 6.00, as I have each evening except Monday. It’s never easy to predict how long such a project might take but I’ll continue after the Bank Holiday and will finish with one more day. I’m closing on the finishing straight, I may be on course to complete the task tomorrow. Both grey tones have been applied and now that I have begun using black paint the portraits are beginning to emerge from the wall. A comment by one child has to be the quote of the day, describing the painting as ‘Museum worthy’ – I’ve always wanted to paint one of those! However I hear some strange and amusing things during the course of a day, yesterday I’m sure I heard someone say ‘I’ve got a brick banana’!!! 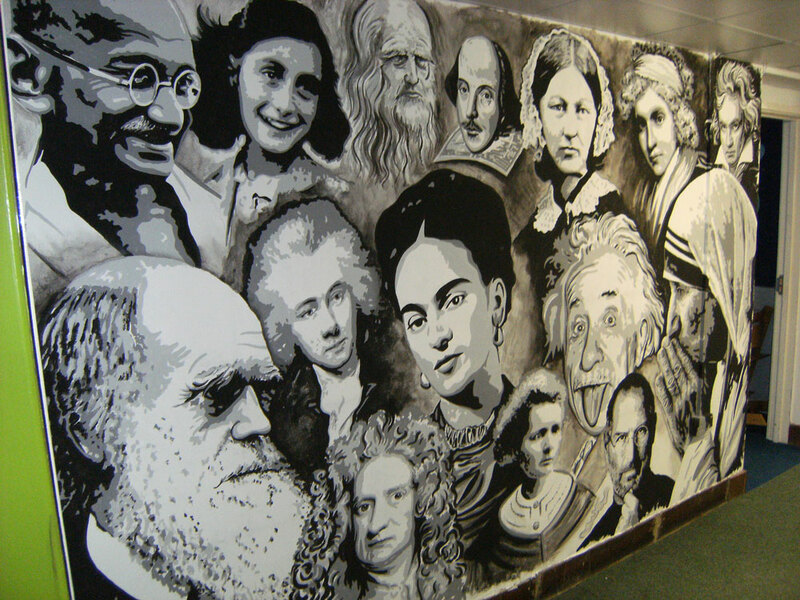 I’m working in a corridor with two classrooms close by and it has been an education and privilege to hear lessons in a variety of subjects being delivered with such energy and enthusiasm. My school experience of maths, history and science wasn’t presented in such a stimulating manner. Simon – you’re a star! It’s been a change of discipline working in such a methodical way, so different from my landscape work, but the mural is certainly not a painting by numbers. I need to continue further with the black tone in the morning and will then revisit different areas to modify elements and unify the composition, so that the end result isn’t simply a collection of 15 unconnected pieces. It’s been another full day and I’ve made good progress, time will tell if it’s enough. Nevertheless I couldn’t have worked faster or done more than I have. The children are seeing a very large painting evolve from a blank white surface into a finished state gradually as each day passes, and they’re able to speak with the person doing it. The day began where I left off yesterday, applying a light grey tone to each of the 15 portraits, but by late morning I began application of the darker grey tone. The composition is beginning to take shape, I would like to have completed this stage and begun applying the black tone before I leave tomorrow. I’m receiving a regular stream of compliments while I’m working from passers by, both adult and student, which is encouraging. This afternoon a whole class, primed by their teacher, walked by in single file, each saying “It’s coming along” as they passed me – imitating their teacher who has spoken that same line every time he’s walked by. Thank you Craig! There’s a great atmosphere in this school! The journey to school took an hour thanks to a traffic jam on the Parkway, I arrived at 9.25 and my first job of the day was to complete the drawing in of the design. An hour later this had been achieved and I began mixing two contrasting grey tones using the white and black emulsion Iain bought for me yesterday. Hopefully I’ve mixed enough to paint the whole composition, I’ll never be able to mix the same tones again! The rest of the day has been spent painting. There have been several interruptions with many conversations taking place as children and adults pass by. I worked till 6.00 to stand a chance of meeting my deadline, my original estimate to Iain was that the painting should take about 5 days. I’ll have a clearer idea at the end of tomorrow’s session whether I will be able to achieve this. You don’t become a ‘champion’ by half measures and everyone included in this composition achieved their reputations through their dedication and by keeping on fighting – till the end. Sharing the presence of these special people is going to be motivation in itself this week but Freddie’s words have always been an inspiration, I know I will hear him singing in my head. There are always things that can go wrong with painting projects, large or small, I’m going to have to keep on fighting too in order to achieve a successful conclusion. 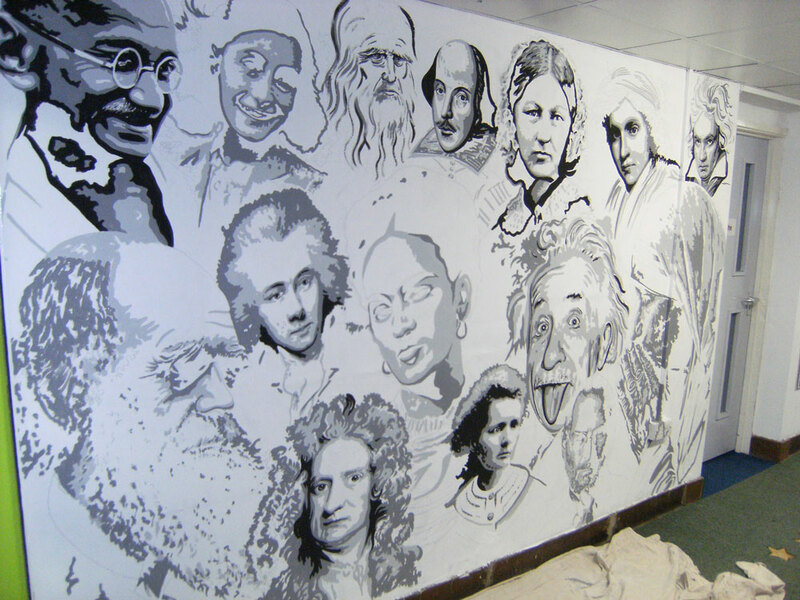 I arrived at Fulbridge School at 9.00 and after organising myself with step ladders, projector and assorted materials in Shrek Way, my corridor base for this week, I began work with the ‘Champions of Humanity’ mural project. I’ve had a good and full day, working continuously. 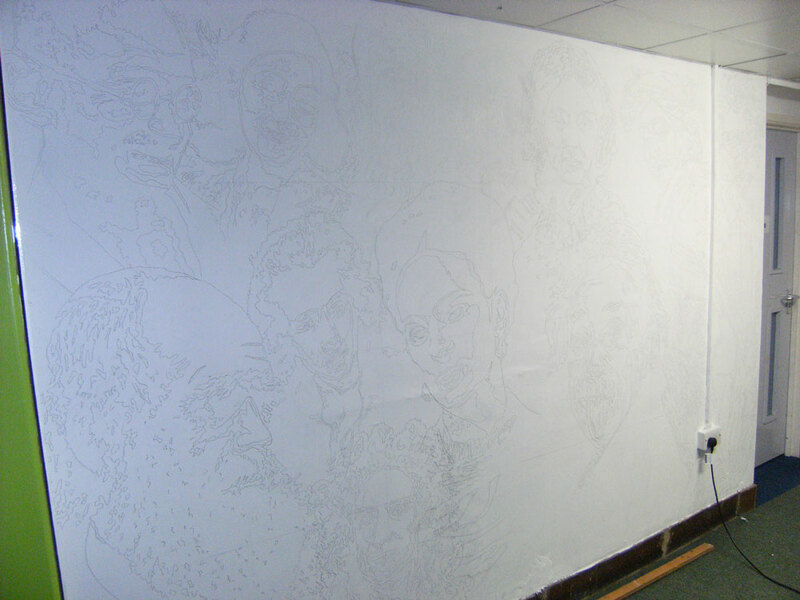 When I left the building at 5.00 I had 13 of the 15 portraits drawn on the wall. There have been some interesting reactions to my presence in the corridor, obviously the children are used to outside visitors but I’ve had several questions to answer. My space is very public; staff, school visitors and children have been walking past all day, talking with me and watching. I’m certainly not working in a hidden and private area, this is a far cry from the peace and quiet of my studio, I’m going to be under the microscope all week. I’m pleased with the progress I’ve made and have more completed than I thought I would at this stage. It’s been a tough day physically and mentally. It’s going to be a demanding week. 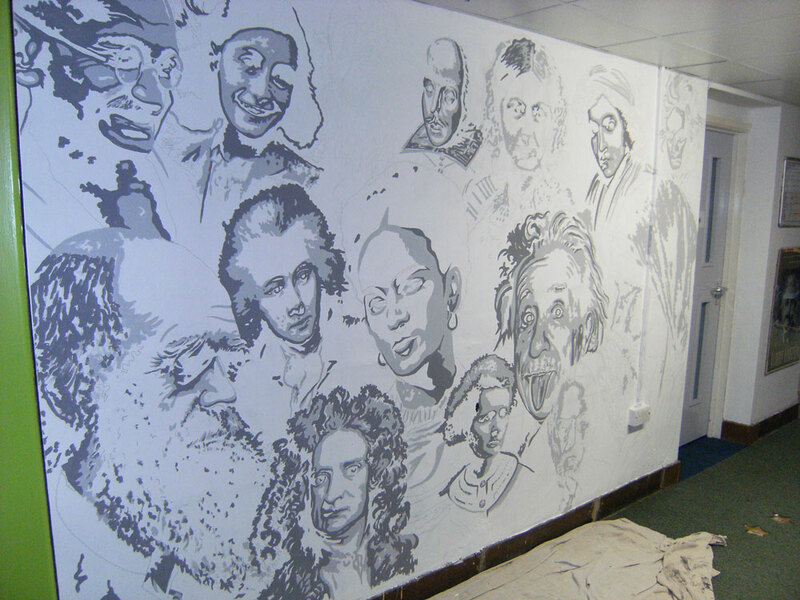 My mission, if I chose to accept it, was a mural, an invitation from Iain Erskine, Head of Fulbridge School, Peterborough. The theme – ‘Champions of Humanity’. The catch – that it would be painted in a corridor during a normal school day, with staff and children watching its progress as they went about their daily routine. It would be my first major project since ‘Black Sunday‘, and an opportunity to paint on a large scale again. I picked up the gauntlet and accepted the challenge. 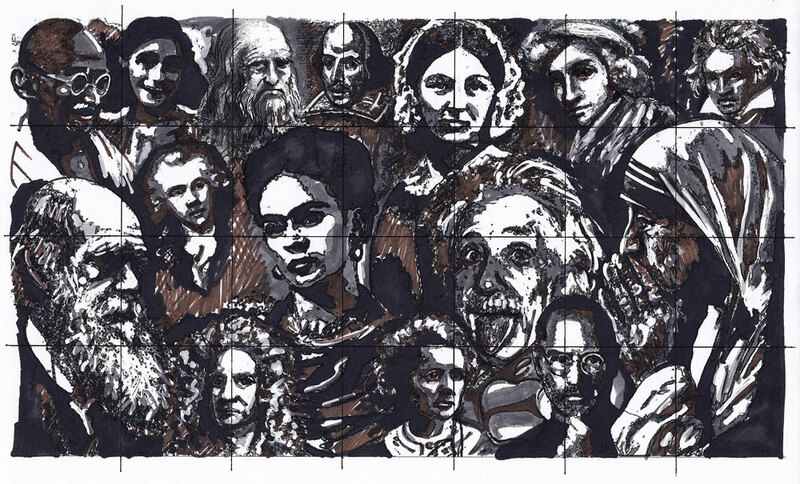 My brief was to produce a painting comprised of inspirational people whose influence has extended beyond their years, and which has shaped the world we live in today. 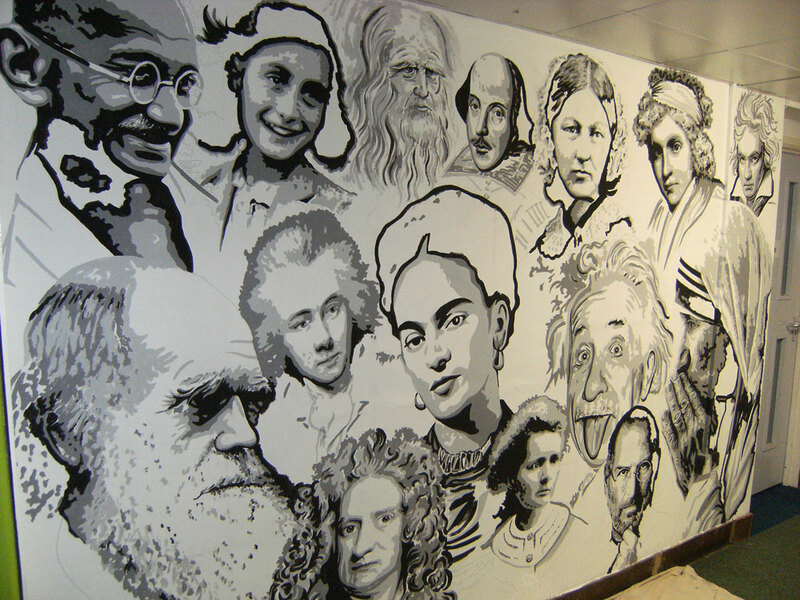 I was determined to design a composition which would become a bold feature within the school, a conversation piece and with an even mix of gender. I had already decided that the final image would be monochrome, allowing the image to achieve the ‘timeless’ appearance of a black & white photograph. However the main problem I faced with the design, with its collection of famous personalities gathered together, was to avoid the composition resembling a Beatles ‘Sgt. Pepper’ album cover, or a Dutch Golden Age group portrait of militia companies or guild members. My solution was to produce a composition which took the appearance of a collage, as if it was a page from a scrapbook where images have been found and pasted together. Although there were variations in scale this was simply an aesthetic decision and not intended to denote importance or hierarchy.